Conrad Brill, known as Konretja, was born in Norka, Russia on October 8, 1895. 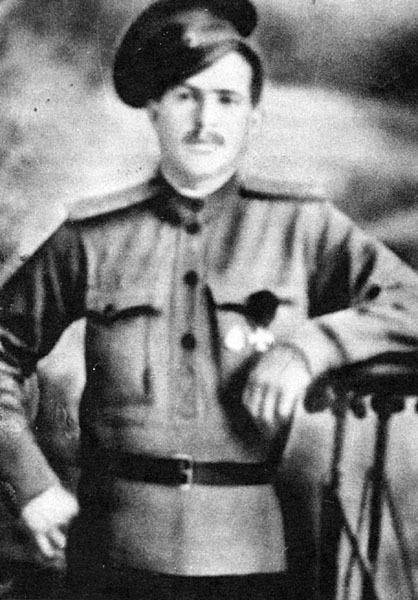 After serving in the Russian Army during World War I, he left Norka on Christmas Eve in 1921 with his first wife and seven-year-old son, Adam. His wife died of influenza on the journey, but Conrad and his son were able to reach the refugee camp at Frankfurt and der Oder. There he met Anna Becker, who was from the colony of Erlenbach. Anna wanted to come to the United States to join her brother and sister. Conrad and Anna were married in Frankfurt an der Oder in 1922 and arrived in New York later that year. They traveled by train to Portland, Oregon where they settled with other families from Norka. Photograph of Conrad Brill in 1914. In his memoirs titled Memories of Norka, Conrad Brill tells of his childhood in Norka, some of his experiences in the Imperial Army, his flight from Russia and journey to the United States. These memoirs were told to his son, George Brill, who recorded them on paper as a tribute to his father who had a keen interest in preserving the family history. Memories of Norka provides a unique and valuable view into the lives of the people from Norka. Conrad Brill also drew a map of Norka, as it was in 1921. The map is available for purchase from AHSGR in Lincoln, Nebraska. George Brill, son of Conrad Brill.